We're proud to let you know thatBais Menachem's Jewish Calendar is now in its4th year of production! Over the years, the calendar has become a great tool that has allowed our team of friends and supporters to stay involved and connected with the work we do for teens and youth. The calendar is filled with beautiful pictures of our students and staff throughout their annual journey of growth, self-discovery, friendship and fun. It is mailed free of charge to over 2,000 families in our local region and to our alumni, friends & supporters worldwide. 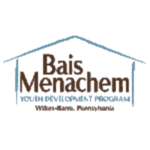 Our goal atBaisMenachem is raise the standards of our future by providing an authentic experience for each person, allowing him to find himself and chart a meaningful course for his life. Please join us in this valuable mitzvah and help sponsor the Jewish Calendar. With warm regards and blessing for a happy & healthy summer. Monthly Banner Ad Full Width | $360 10.5" x 2"
Monthly Banner Ad Half Width | $180 5.25" x 2"